KANSAS CITY, MO--(Marketwired - Aug 30, 2013) - A team of Burns & McDonnell engineers, along with subcontractor Coritech Services has developed a system of bidirectional, fast-charging stations for a fleet of plug-in electric vehicles at Fort Carson, CO. This first-of-its-kind system will push power back to the base microgrid when needed to meet installation demand or improve overall power quality. 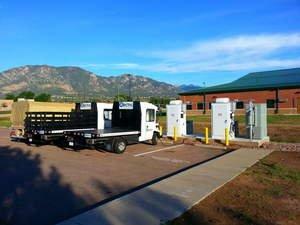 On Aug. 29, the team successfully commissioned five bidirectional chargers and the aggregating control system as part of the Smart Power Infrastructure Demonstration for Energy Reliability and Security (SPIDERS) microgrid project at Fort Carson. Commissioning was performed using both Boulder Electric Vehicle and Smith Electric trucks, which are being provided for use on SPIDERS under separate agreements with the U.S. Army's Construction Engineering Research Laboratory (CERL) and Tank Automotive Research, Development and Engineering Center (TARDEC). Commissioning of the vehicle charging stations represents an important milestone of the Fort Carson SPIDERS project, which is nearing completion. The project is managed by the U.S. Army Corps of Engineers (USACE) Omaha District and includes technical guidance from CERL and TARDEC. The bidirectional charging units are capable of providing up to 300 kilowatts (kW) of power to plug-in electric vehicles and also can discharge a like amount of stored energy from the vehicle batteries to the grid or microgrid via Society of Automotive Engineers (SAE) standard J1772-compliant bi-directional charging cables. The vehicle-to-grid (V2G) charging includes power factor correction, which is a growing concern at locations such as Fort Carson that are experiencing a growth in on-site solar power generation resulting in utility rate penalties. Each of the five chargers have been tested to charge and discharge at full capacity of 60kW, and have imported and exported a combined 394 kVAR (reactive power that diminishes the real power capacity of transmission lines) to the local grid even when electric vehicles are not connected to the chargers. This provides a 24-hour per day benefit to Fort Carson by absorbing VARs from the grid, thus increasing the power factor of the loads at Fort Carson and making the transmission of power from the local utility more efficient and less costly. The chargers are also integrated into the SPIDERS backup power microgrid which allows the installation to utilize a fleet of bidirectional-capable electric vehicles as energy storage devices that, in conjunction with diesel generators and a 2-megawatt (MW) solar photovoltaic array, increases the reliability and efficiency of backup power systems to critical facilities at Fort Carson. The Burns & McDonnell team also includes Southwest Research Institute (SwRI) and Intelligent Power & Energy Research Corporation (IPERC) that provided design, programming and aggregation of the vehicle charging solution and microgrid integration. Burns & McDonnell provides engineering, architecture, construction, environmental and consulting services to clients throughout North America and abroad. More than 4,000 engineers, architects, scientists, planners, estimators, economists, technicians and other professionals work in more than 20 regional, national and international offices. Founded in 1898, Burns & McDonnell is 100 percent employee-owned and is currently ranked Number 20 on the Engineering News-Record Top 500 Design Firms. For more information about Burns & McDonnell, visit its website at www.burnsmcd.com.